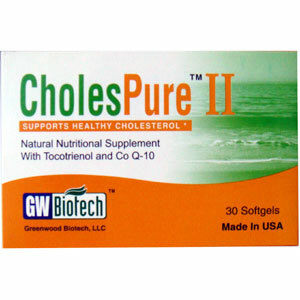 CholesPure has been uniquely designed to combine the delta-tocotrienol, gamma-tocotrienol and proprietary premium herbal extract blend that help in the maintenance of a healthy cholesterol and triglycerides. Fats (lipids) are an essential source of energy in the body. The two major fats in the blood are cholesterol and triglyceride. Abnormal levels of fats circulating in the bloodstream, especially cholesterol, can lead to long-term health problems and are an important risk factor in developing cardiovascular or cerebrovascular disease, such as atherosclerosis, heart disease, hypertension and stroke, or fatty liver. CholesPure has been scientifically designed to combine the known beneficial effects of delta-tocotrienol, gamma-tocotrienol, and the proprietary herabl extract blend that help improve cardiovascular health through maintaining healthy cholesterol and triglyceride. CholesPure may help reduce cholesterol by inhibiting cholesterol production in the liver and absorption in the intestine. To ensure the high quality and potency, the modern biotechnologies are utilized in the manufacturing process. Astragalus membranaceus, Salvia miltiorrhiza Bge., Polygonum multiflorum Thunb., Gynostemma pentaphyllum Makino, Crataegus pinnatifida Bge. (Hawthorn). For adults, take 3 to 4 softgels daily, preferably before bedtime. You may take 4 to 5 softgels in a day if you have circulating problems such as high cholesterol, high triglycerides, atherosclerosis (arterial blockage), heart disease, hypertension, obesity or fatty liver. To obtain maximum benefit, 3 months continuously dosage is recommended. If you are pregnant or nursing a baby, taking any medication or have a medical condition, consult your physician before taking any dietary supplement.